This article first appeared in The Edge Financial Daily, on October 13, 2017. KUALA LUMPUR: The international trade and industry ministry (Miti) has proposed several measures for the upcoming Budget 2018, including automation grants, to enhance implementation of Industry 4.0, according to Second International Trade and Industry Minister Datuk Seri Ong Ka Chuan. Ong suggested that the finance ministry should prioritise incentives for small and medium enterprises (SMEs) to equip themselves with high technology, especially at initial stages. However, he pointed out that the government does not intend to give a one-size-fits-all “blanket” to cover all industry players. “The government is not totally passive, but we will help only those who are ready and have the market size to go for it (digital revolution). They are the ones who will be able to enjoy tax incentives,” said Ong. He also said the government through Miti is leading the efforts in developing a National Industry 4.0 policy framework in collaboration with other key ministries. Several initiatives have since been embarked on, including the Malaysia Productivity Blueprint in line with the 11th Malaysia Plan, National Internet of Things Strategic Roadmap and the Digital Free Trade Zone, Ong added. According to him, the country’s adoption of Industry 4.0 is very low for the time being. Ong’s comment was in response to the outcome of the Business Conditions Survey in the second half of 2016 conducted by the Federation of Malaysian Manufacturers (FMM) and Malaysian Institute of Economic Research, which showed that only 12% of the respondents had full awareness of the Industry 4.0 wave. 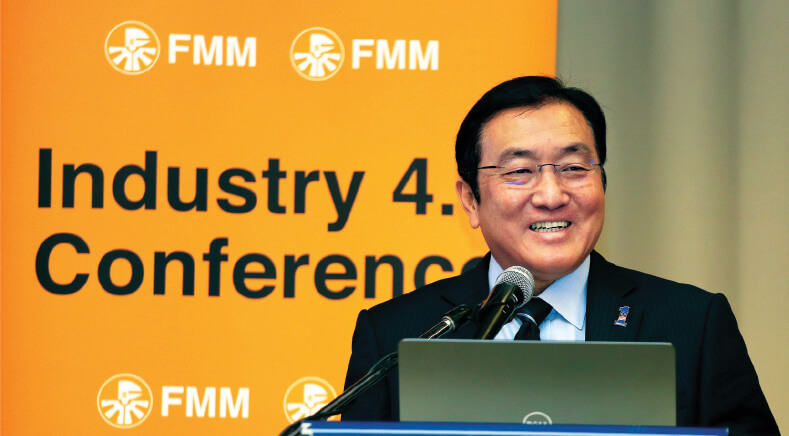 “In order to achieve this (Industry 4.0), it is not only technology; businesses will also need a market size big enough to encourage them to go for the implementation,” he told reporters after officiating at FMM’s Industry 4.0 Conference here yesterday. He said this is particularly true for SMEs, since the relatively small domestic market does not provide enough incentives for them to adopt digital innovation, given the high implementation cost. “We need to integrate into the bigger market. We have signed 13 free trade agreements so far and will be concluding the Asean-Hong Kong Free Trade Agreement next month at the summit,” Ong said. Furthermore, Ong pointed out that the manufacturing sector is an important industry to the country’s economy as 82.2%, or RM646 billion, of Malaysia’s export income came from the export of manufactured goods in 2016. “Depending on the export of raw materials, such as palm oil, [alone], we cannot go anywhere close to becoming a high-income nation. Hence, value-add[ing] is our direction and Industry 4.0 is the solution,” Ong said. “We are doing well, but I think we can do better if we can automate and improve efficiency of manufacturing lines,” Ong said, hinting that there may be a chance for Malaysia to achieve the RM2 trillion trade volume mark this year.